Cotton Seed can be obtained by chance by harvesting jungle grass or a cotton plant. 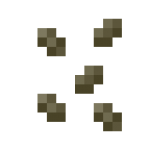 Cotton seed can be placed on any soil-like block. It grows on wet soil and wet desert sand soil. After a while, it grows into a cotton plant of size 1. This page was last modified on 18 October 2017, at 13:38.